Jim has been practicing massage since 1992 and is a graduate of the Pennsylvania Institute of Massage Therapy. He has been an instructor of massage since 1996 and has taught over 400 students the healing touch of massage therapy. 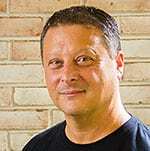 Jim is also the owner and operator of Rapunzel’s Salon & Day Spa in Lansdale, PA. Jim currently is the co-owner of the Academy of Massage Therapy and Bodyworks in Pottstown, PA; where he also is an instructor of massage theory and practice. Jim’s Certifications Include: Thai Bodywork, Myofacial Release, LomiLomi Massage, Lymphatic Drainage, Craniosacral Therapy, Neuromuscular Therapy, LaStone Hot Rock Massage, Cupping and Forearm Fusion™.